Having a green drink of Aojiru borrowed from the Japanese diet is the best way to go on the green juice diet and start losing fast the healthy way with only one cup a day. Aojiru an herbal drink native to Japan consists of combining kale and other mean green ingredients such as Komatsunathat is drank for longevity. Outside of Japan it is referred to as green juice, green drink, or simply Aojiru, which literal means green soup-like drink in Japanese. 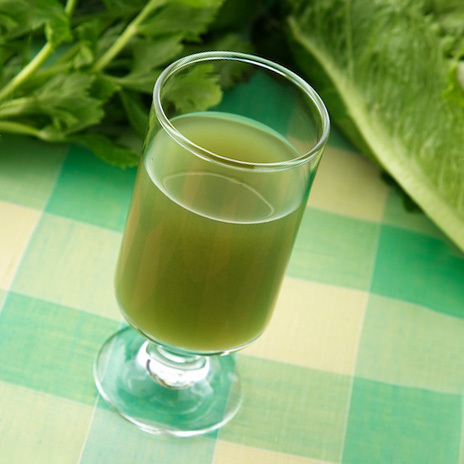 What is the Japanese vegetable drink Aojiru green juice diet? The Aojiru Diet is synonymous with the green juice diet found in the states. Where it may differ from the green juice diet is in the recommended consumption that you must drink to stay healthy and live longer. 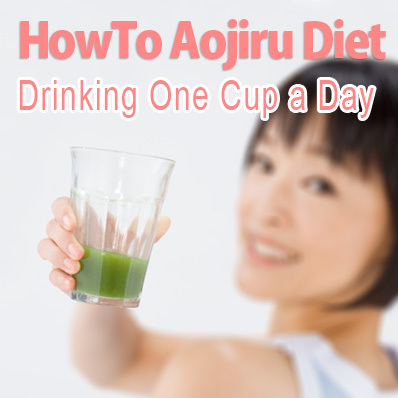 On the Aojiru diet all you have to do is drink only 1 cup of Aojiru per day! 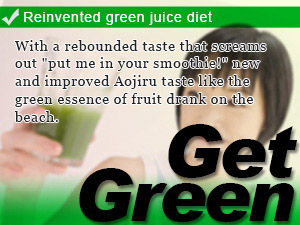 The number of people going on the Aojiru diet is increasing as these green drink become easier and easier to drink. If you've tried a glass of Aojiru lately what you will notice is that not only is it drinkable, it tastes great just like a green smoothie. Aojiru is a good source of dietary fiber that that can help you prevent constipation as well as increase your metabolism, give you lustrous skin, and boost immunity in your body minus the dietary restrictions other diets force on you in order to become skinny. In this take on Slism, we will discuss what the Aojiru diet is breaking down the health benefits it has to offer as well as presenting necessary areas of precaution that you should be concerned about. How The Aojiru Diet Works! Aojiru is a food that makes the body become skinny easily by supporting your diet. To compensate in nutrients that your body tends to be insufficient in only drinking one cup a dayof Aojiru does the trick of revitalizing your body giving you more energy to stay active. Although the timing which drinks Aojiru was not decided, recommendation time to drink before eating a meal while dieting. Since the dietary fiber mostly contained in Aojiru gives a feeling of stomach fullness, it prevents overeating. That means eating less and still leaving the table with a feeling of fullness hitting the spot of satisfaction. Although overeating is not good, the balance of nutrition will be lost, if it says and a meal is transposed only to Aojiru. Probably, it is good to keep in mind the meal and moderate eating which was able to take nutritional balance, drinking Aojiru. The dietary fiber abundantly contained in Aojiru decreases the bad bacteria in intestines, and has the work which reduces the toxic substance which bad bacteria make. Dietary fiber in Aojiru works similarly to how yogurt too also helps reduce the bad bacteria count in your intestines with added benefits. 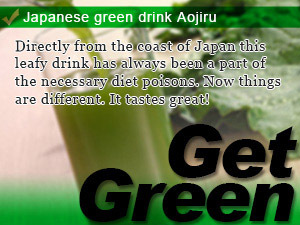 What are the healthy green juice benefits of drinking the Japanese Aojiru? Therefore, effects, such as making hard to accumulate the fat which an intestinal environment is ready and raises basal metabolism, are acquired. Furthermore, in dietary fiber, it is also working to drain the extra fat and sugars, is one of the nutrients that you want to ingest a diet firm. In addition, although there are also many people who drink Aojiru for beauty, not only contains a lot of vitamin C effective skin, by dietary fiber prepare the intestinal environment, the Aojiru is vitamin and mineral enhance the absorption of additional skin effect is expected. Aojiru diet is cleaning intestines and is a method of going on a diet the recommendation which makes the body which becomes skinny easily and makes skin beautiful out of the body. Aojiru has a reputation of being hard to drink. This alone has been said to be one of the major difficulties of going on the Aojiru green juice diet. Some would call it the necessary poison of a healthy diet, but others would just call it goblin juice. What's so bad about the old Japanese Aojiru green juice diet? However, many goods which are easy to drink, such as powdered-green-tea flavor and honey flavor, are also sold in recent years. People are even exploring new ways to drink Aojiru with green juice recipes that including mixing with soy milk, milk, and fruit. If you thought the Aojiru diet was tough, then you might want to pick it up again and get an updated opinion. There is to what would seem like an endless assortment of flavors and variety to fit you no matter what you disposition may be. There are also Aojiru-products that are blended collagen and oligosaccharides in Aojiru, it is better to use the Aojiru-products as well as to compare the effectiveness drinkability, suits you. Since a trial sample can also be purchased, it may also be good to try various Aojiru-products. Directly from the coast of Japan this leafy drink has always been a part of the necessary diet poisons. Now things are different. It tastes great! With a rebounded taste that screams out "put me in your smoothie!" new and improved Aojiru taste like the green essence of fruit drank on the beach. 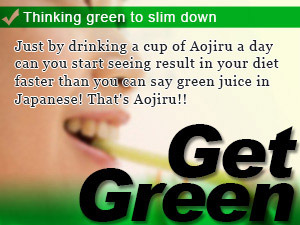 Just by drinking a cup of Aojiru a day can you start seeing result in your diet faster than you can say green juice in Japanese! That's Aojiru! !